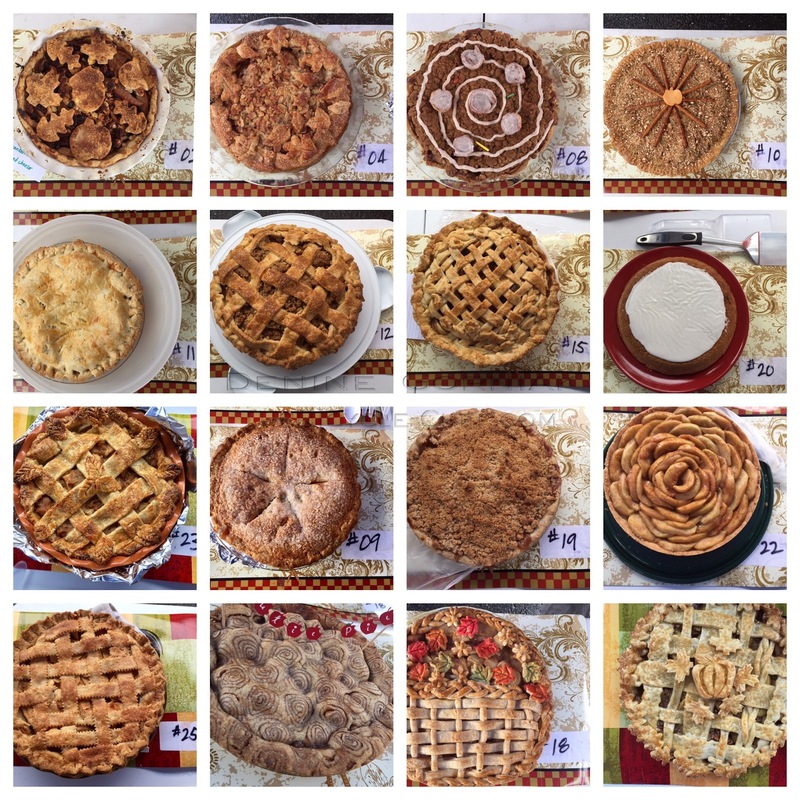 16 Glorious Apple Pies were at the contest, out of 24 from the official entry count. The Umpteenth Annual Apple Pie Contest at the Collingswood Farmers' Market 2018 was held last Saturday, October 13th. I say umpteenth because no one knows for sure how many years it's been held. Best guess is close to 18 years now, since it was started shortly after the Market's creation. As with many of our Saturdays (and other days this past Summer and Fall) we started the day out in the rain. However on this day the skies parted not with a downpour but rather with sun rays. What started out gloomy ended up as a lovely day, filled with bright smiles and warm apple pies! Bottom Right - Emily Thomson and sisters, Caitlin and Danielle Farely. 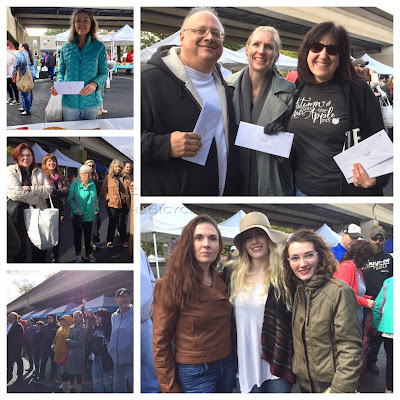 As usual with most food contests at the Market, we started out with the best of intentions - 24 people entered the contest, with 16 participants actually entering their pies this year. Two people won awards for two categories - Presentation and winner in their category - Classic or Apples Plus. All the pies this year were extraordinarily good - not a bad apple in the bunch! The pies were all perfectly baked and were set beautifully, not a runny, ooey gooey one in the lot. I can see that returning bakers have all perfected their baking styles. Not surprisingly, long-time winners returned to take top prizes but there were some new-comers or returning bakers who placed wins having previously not won in years' past. 1st Place - #18 baked by Judy Griffin of Cherry Hill, NJ. Judy is a returning baker and winner. Her gorgeous apple pie had an intricate flower basket motif, with lattice, flowers, braiding, and food colour painted flowers. Her pie was a true work of art. 2nd Place - # 1 baked by Katie Leidy of Collingswood, NJ. 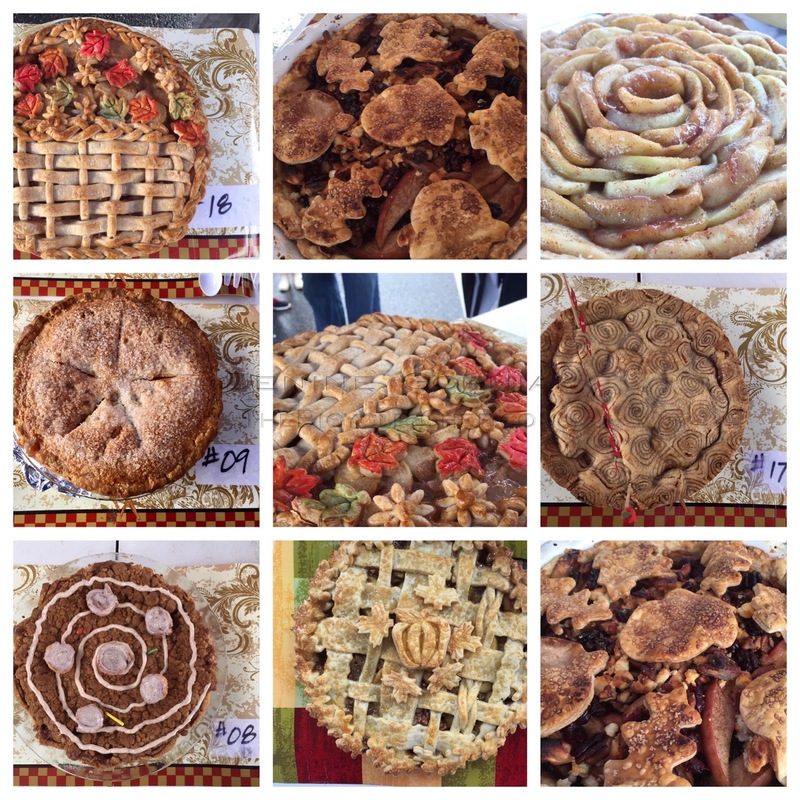 One judge said that her pie looked (and tasted) like the essence of Fall. Katie is another returning food contest entrant - having baked apple and peach pies before and she's made a salsa for the Summer Salsa Contest. Katie was the only person not at the contest on Saturday. Her pie made it to the Market by way of her friends. Sorry Katie - no photo of you to share here! 3rd Place - #22 baked by Roberta Sykes of Haddon Township, NJ. Her pretty rosette pie with a short crust bottom was simple elegance. 1st Place - #9 baked by returning winner, Charles DeFranco of Allentown, NJ. His pie, Mimi and Moe's Classic Apple was a sure-fire winner because it was still warm. The filling was not too sweet and had tender apples. 2nd Place - #17 baked by Natasha Zirbel of Oaklyn, NJ. Another returning pie baker and winner! Natasha's Apple of my Pie had a fantastic top crust design of cinnamon swirls flanked by a little flag of apple cut-outs forming the words Cutie Pie. The crust could have been its own dessert. 3rd Place - #18 baked by Presentation winner, Judy Griffin of Cherry Hill, NJ. Judy knows how to bake a good pie. Tender crust, well cooked apples with a perfect consistency. She called it a Dream Pie and it was indeed a dream. 1st Place - #8 baked by sisters, Danielle and Caitlin Farley, of Cherry Hill, NJ. This crumb topped pie was further embellished iwht little cinnamon buns and a cinnamon caramel drizzle. Had this pie been warm, it might not have made it home with the bakers after the contest because I would have made off with it! 2nd Place - # 24 baked by our long-time winner pie baker, Emily Thomson, of Wenonah, NJ. Her Pecan Apple Pie was another stunner. Emily, like her pie winning mom, Jane Walker, knows her way around an intricately topped pie. Lattice, weaving, and a hand-made, hand-cut apple pie apple cookie topped this superb tender pie. 3rd Place - # 1 baked by Katie Leidy, Collingswood, NJ. As one of the judges said to us while we were tasting the pies, this pie tasted and looked like Fall. A deep burnish of cut-out leaves and apples pie crusts topped toothsome apple slices that were further embellished with pecans, craisins, and goat cheese. Sweet meets Savory, Katie's pie was called, Who You Calling a Tart? This was one of the more difficult pie contests to judge because this was one of the first times when all the pies were top notch. Some edged others out merely because they were still warm. Not a bad bite or rotten apple to be found. Great work everyone!